One of the most rewarding pursuits as a gardener is starting your own plants from seeds. The potential for beauty, fruitfulness and aroma locked up in each tiny seed is awesome. However, growing your plants from seeds is not always a sure thing, or an easy task. Here are some techniques and tips to get your seeds off to a good start. 1. Be a record keeper. Record where you bought your seeds. Record when you plant the seeds, the date they actually germinate, and the success rate. Keep a record of how long it takes for the seedlings to be ready to transplant. Note what went right or wrong with your timing. These observations, when recorded, will make your next year’s tasks much easier. 2. Store seeds properly. If you have stored your seeds properly, they may be viable much longer. To keep them dormant, seeds should be stored in a cool dark place with low humidity. Make sure you label all your seeds, with name, source, and year. 3. Choose wide flat containers. Plastics are preferable, since they retain moisture better than clay or wood. A wide flat container will give you more room to space the seeds so the seedlings won’t be overcrowded. Plants that dislike root disturbance can be planted into small individual containers. No matter what container you use, make sure it is clean, pathogen-free and has good drainage. 4. Tamp down the seeds. Most seeds should be covered with soil to the depth of twice the seed diameter. Some tiny seeds, or ones that need light to germinate should lie directly on the soil surface. Either way, the seeds need firm contact with moist soil to germinate. You can use the bottom of a glass to gently tamp them down. 5. Provide drainage and air flow. The fungus infection known as damping off is usually a result of too much moisture and poor air circulation. Two tips for preventing this: sprinkle a fine grit or dry sphagnum on the surface to keep the emerging shoots dry, and use a small fan on low to circulate air around the seedlings. 6. Keep moisture level constant. The best way to keep the moisture content of the soil constant is to secure plastic wrap or a clear plastic bag over the freshly seeded pot. Check daily for moisture and germination, and when the seeds have germinated, remove the covering. Since top watering can disturb emerging seedlings, hydrate by placing the entire pot in a couple of inches of warm water so the planting medium wicks moisture upwards. 7. Keep your seeds warm. Most seeds need a temperature of around 70F degrees to germinate. Use a space heater or a heating pad beneath the seeded trays. Gardening centers have special heating pads designed for germinating. Keep an eye on moisture levels, to ensure the seed containers don’t dry out. 8. Rotate your seedlings. Once your seeds have germinated, place the containers in a sunny south-facing window and turn the container a quarter turn each day. This prevents the seedlings from reaching towards the light and growing bent and elongated stems. Brush the tops of the seedlings lightly to encourage stronger stem growth. 9. Feed them. Most seed-starting mixtures contain nutrients to help new seedlings develop roots and the first leaves. Once true leaves emerge, begin feeding the seedlings weekly with half strength liquid fertilizer to encourage growth. 10. Acclimate. All seedlings heed to be hardened off to direct sunlight and inconsistent outdoor temperatures. Place them in direct sunlight in the morning only for a day, then increase the time outside over the next few of days. Transplant them when they are vigorous enough. Practice these ten steps, and your seeds will get off to a healthy start this spring and every spring to come. Gardening expert Nicki Goff offers a free e-mail starter course all about her main passion… herb gardening. Visit her website for access, and even more great tips in her new comprehensive e-book on creating, maintaining and enjoying your own home herb garden, along with bonus e-books on specific aspects of herb lore. She also posts on her general garden blog. 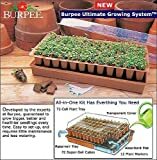 This entry was posted in Homesteading/Self-Sufficiency Articles and tagged beginner gardening tips, how to start seeds, starting seeds on March 15, 2010 by admin.